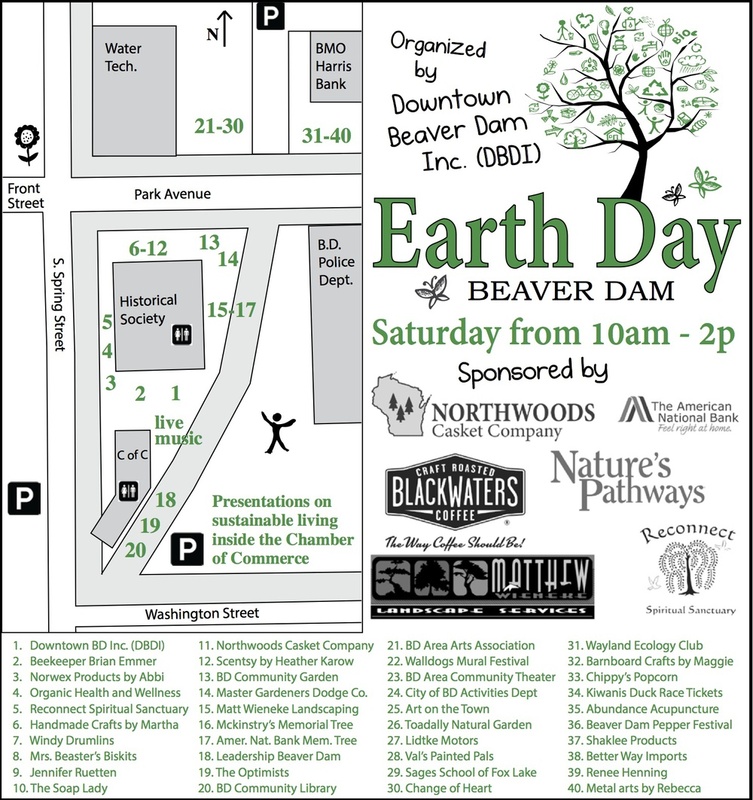 Downtown Beaver Dam, Inc. (DBDI) has organized a full week of events for the 2nd Earth Day Festival during the week of April 20-25th. The week-long festival culminates on Saturday, April 25th with a series of special presentations in conjunction with an outdoor market downtown Beaver Dam. The interactive outdoor market features 50 vendors, local businesses, and local civic clubs with educational displays. The family friendly market features information about caring for our earth, ecology and sustainability. Vendors will be located around the Beaver Dam Chamber of Commerce, the Dodge County Historical Society, in the parking lot of Water Technology, and on the front lawn of BMO Harris Bank. The market is open from 10:00am to 2:00pm rain or shine; admission is free to the public. Outdoor music will be provided by the Riverside Regulars and Bradley Sperger. Various restaurants will be hosting Earth Day specials. The event is coordinated by DBDI and sponsored by Nature’s Pathways Magazine, Northwoods Casket Company, Matt Weineke Landscaping, Reconnect Spiritual Sanctuary, Black Waters Coffee, American National Bank and McKinstry’s Home Furnishings. Organized by Downtown Beaver Dam, Inc.
Children at area schools, 4k, and the Middle School hand decorated more than 700 paper grocery shopping bags for Earth Day. Children expressed their views of what Earth Day, sustainability, and the importance of caring for our plant means to them. Stop by Recheck's Food Pride or Piggly Wiggly during the week and ask your grocery bagger to "make it paper" this week. Area schools will organize groups of school children to tidy up the school grounds in our community. Held in parking lot behind the food pantry (Central WI Community Action Council) at 134 South Spring Street. Every 110 pounds of material shredded saves approximately 1 standard paper mill tree. Please bring non-perishable food item as a small donation for the Dodge County Food Pantry. AM Kiwanis Club Aluminum Can Drive at Recheck’s Food Pride. A trailer will be parked at the north end of Recheck’s parking lot for your cans to be collected. Lexicon of Sustainability Art Exhibit at Beaver Dam Community Hospital Café. A new pop up art show includes 24 enlarged photos about sustainable farming. The community is invited to view the collection, taste local foods and share in conversation. Admission is free. Join the children at Jefferson Elementary School for their annual tree planting festival sponsored by the Beaver Dam Rotary. In addition to tree planing, the day will include a tree-climbing demonstration by certified arborist, John Herzog. Anyone interested in helping is welcome to come lend a hand. We'll have supplies...just show up and help make the downtown festival area shine! We'll be working around the Beaver Dam Area Chamber of Commerce and the Historical Museum. 12:15pm - "Scrap is not waste. Recycling is not disposal." Scrap is not waste. Recycling is not disposal. Learn about scrap metal recycling, the original green industry. Discover the history of scrap recycling, the value of scrap and the current status. All ages welcome (child friendly). Learn about bee hive operation and observations from a bee keeper. This presentation is for all ages and is child friendly. The April 25th outdoor market will open at 8:00am to set up with a 10:00am start. Tear down is scheduled for 2:00pm. Pre-registration is requested. Vendor applications may be obtained by contacting Julie Hogan at (920) 342-8955, or by emailing julie@reconnectspiritually.com. For more information or to volunteer for community cleanup, contact Julie Zahn at Northwoods Casket Co. by email at julie.zahn@northwoodscasket.com or call (920) 631-7077.